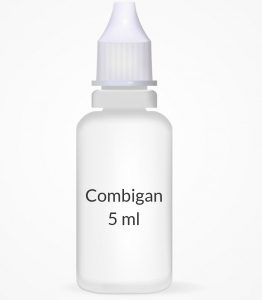 USES: This combination medication is used to treat high pressure inside the eye due to glaucoma (open-angle type) or other eye diseases (e.g., ocular hypertension). Lowering high pressure inside the eye helps to prevent blindness. This product contains brimonidine and timolol. These medications are used together when 1 drug is not controlling the pressure inside the eye. Brimonidine works by allowing better fluid drainage from within the eye and also by decreasing the amount of fluid formed in the eye. It belongs to a class of drugs known as alpha agonists. Timolol is thought to work by decreasing the amount of fluid formed in the eye. Timolol belongs to a class of drugs known as beta blockers. This medication is not recommended for use in children due to an increased risk of serious side effects. Ask the doctor or pharmacist for more details. HOW TO USE: This medication may come with a Patient Information Leaflet. Read the Patient Information Leaflet provided by your pharmacist before you start using this product and each time you get a refill. If you have any questions, consult your doctor or pharmacist. To apply eye drops, wash your hands first. To avoid contamination, do not touch the dropper tip or let it touch your eye or any other surface. The preservative in this product may be absorbed by contact lenses. If you wear contact lenses, remove them before using the eye drops. Wait at least 15 minutes after using this medication before putting in your contact lenses. Tilt your head back, look up, and pull down the lower eyelid to make a pouch. Hold the dropper directly over your eye and place 1 drop in the pouch, usually 2 times daily (12 hours apart) or as directed by your doctor. Look down and gently close your eyes for 1 to 2 minutes. Place one finger at the corner of your eye (near the nose) and apply gentle pressure. This will prevent the medication from draining away from the eye. Try not to blink and do not rub your eye. Repeat these steps for your other eye if so directed. Do not rinse the dropper. Replace the dropper cap after each use. If you are using another kind of eye medication (e.g., drops or ointments), wait at least 10 minutes before applying other medications. Use eye drops before eye ointments to allow the eye drops to enter the eye. Use this medication regularly in order to get the most benefit from it. To help you remember, use it at the same times each day. It is important to continue using this medication even if you feel well. Most people with glaucoma or high pressure in the eyes do not feel sick. SIDE EFFECTS: Temporary blurred vision, temporary burning/stinging/itching/redness of the eye, watery eyes, dry eyes, dry mouth, feeling as if something is in the eye, headache, dizziness, or drowsiness may occur. If any of these effects persist or worsen, tell your doctor or pharmacist promptly. Remember that your doctor has prescribed this medication because the benefit to you is greater than the risk of side effects. Many people using this medication do not have serious side effects. Tell your doctor immediately if any of these unlikely but serious side effects occur: vision changes, eye sensitivity to light, eye pain/swelling/discharge, slow/irregular heartbeat, muscle weakness, unusual tiredness, mental/mood changes, coldness/numbness/pain in the hands or feet, swelling ankles/feet, sudden unexplained weight gain, shortness of breath. Seek immediate medical attention if any of these rare but very serious side effects occur: trouble breathing, chest pain, weakness on one side of the body, slurred speech, confusion, persistent dizziness, fainting. A very serious allergic reaction to this drug is unlikely, but seek immediate medical attention if it occurs. Symptoms of a serious allergic reaction may include: rash, itching/swelling (especially of the face/tongue/throat), severe dizziness, trouble breathing. This is not a complete list of possible side effects. If you notice other effects not listed above, contact your doctor or pharmacist. In the US - Call your doctor for medical advice about side effects. You may report side effects to FDA at 1-800-FDA-1088. In Canada - Call your doctor for medical advice about side effects. You may report side effects to Health Canada at 1-866-234-2345. PRECAUTIONS: Before using this product, tell your doctor or pharmacist if you are allergic to brimonidine or timolol; or to apraclonidine; or if you have any other allergies. This product may contain inactive ingredients (such as preservatives like benzalkonium chloride), which can cause allergic reactions or other problems. Talk to your pharmacist for more details. This medication should not be used if you have certain medical conditions. Before using this medicine, consult your doctor or pharmacist if you have: lung disease (e.g., current or past asthma, severe chronic obstructive pulmonary disease-COPD), certain types of irregular heartbeats (sinus bradycardia, second- or third-degree AV block), certain types of heart disease (severe heart failure, cardiogenic shock). Before using this medication, tell your doctor or pharmacist your medical history, especially of: kidney disease, liver disease, heart disease, blood vessel disease (e.g., thromboangiitis obliterans, Raynaud's phenomenon), blood circulation disorders (cerebral/coronary insufficiency), dizziness after standing (orthostatic hypotension), diabetes, depression, overactive thyroid (hyperthyroidism), muscle weakness disorders (e.g., myasthenia gravis), severe allergies. If you develop an eye infection or injury, or have eye surgery, check with your doctor about whether you should continue to use your current bottle of this medication. You may be advised to start using a new bottle. Before having surgery, tell your doctor or dentist that you are using this medication. If you have diabetes, this product may prevent the fast/pounding heartbeat you would usually feel when your blood sugar level falls too low (hypoglycemia). Other symptoms of low blood sugar, such as dizziness and sweating, are unaffected by this drug. This drug may make you dizzy or drowsy or cause temporary blurred vision. Do not drive, use machinery, or do any activity that requires alertness or clear vision until you are sure you can perform such activities safely. Limit alcoholic beverages. During pregnancy, this medication should be used only when clearly needed. Discuss the risks and benefits with your doctor. This medication passes into breast milk, but is unlikely to harm a nursing infant. Consult your doctor before breast-feeding. DRUG INTERACTIONS: Your doctor or pharmacist may already be aware of any possible drug interactions and may be monitoring you for them. Do not start, stop, or change the dosage of any medicine before checking with your doctor or pharmacist first. This drug should not be used with the following medications because very serious interactions may occur: MAO inhibitors (isocarboxazid, linezolid, methylene blue, moclobemide, phenelzine, procarbazine, rasagiline, selegiline, tranylcypromine). If you are currently using any of these medications listed above, tell your doctor or pharmacist before starting this product. Before using this medication, tell your doctor or pharmacist of all prescription and nonprescription/herbal products you may use, especially of: beta blockers taken by mouth (e.g., propranolol), certain antidepressants (SSRIs such as fluoxetine, tricyclics such as amitriptyline), digoxin, epinephrine, fingolimod, high blood pressure medications (e.g., clonidine, reserpine, methyldopa, calcium channel blockers such as diltiazem/verapamil), quinidine, theophylline. Tell your doctor or pharmacist if you also take drugs that cause drowsiness such as: certain antihistamines (e.g., diphenhydramine), anti-seizure drugs (e.g., carbamazepine), medicine for sleep or anxiety (e.g., alprazolam, diazepam, zolpidem), muscle relaxants, narcotic pain relievers (e.g., codeine), psychiatric medicines (e.g., chlorpromazine, risperidone, amitriptyline, trazodone). Check the labels on all your medicines (e.g., cough-and-cold products) because they may contain ingredients that cause drowsiness. Ask your pharmacist about using those products safely. This document does not contain all possible interactions. Therefore, before using this product, tell your doctor or pharmacist of all the products you use. Keep a list of all your medications with you, and share the list with your doctor and pharmacist. OVERDOSE: This medicine may be harmful if swallowed. If swallowing or overdose is suspected, contact your poison control center or emergency room immediately. US residents can call the US National Poison Hotline at 1-800-222-1222. Canada residents can call a provincial poison control center. Symptoms of overdose may include: trouble breathing, slow heartbeat. NOTES: Do not share this medication with others. Laboratory and/or medical tests (e.g., eye exams, measuring intraocular pressure) should be performed periodically to monitor your progress or check for side effects. Consult your doctor for more details. STORAGE: Store at room temperature between 59-77 degrees F (15-25 degrees C) away from light. Keep all medicines away from children and pets. Do not flush medications down the toilet or pour them into a drain unless instructed to do so. Properly discard this product when it is expired or no longer needed. Consult your pharmacist or local waste disposal company for more details about how to safely discard your product.